Hunting for a large number of people is a glorious escape from the turmoil of their busy lives. In view of this, learning How to Shoot a Compound Bow can be your first step, which would also build your attachment to the wilderness. Compound bows are the fastest, most accurate and the most exciting of bows ever made. As a result, no one can refute their popularity. At first, glance, shooting with a compound bow may seem an easy thing to do. Just picking up the bow and releasing. But in reality, is it so? A good technique coupled with the minute details in the trade clearly plays a very important role in finding your right rhythm. Hence, even the posture you take can bring about stark differences in your aim. 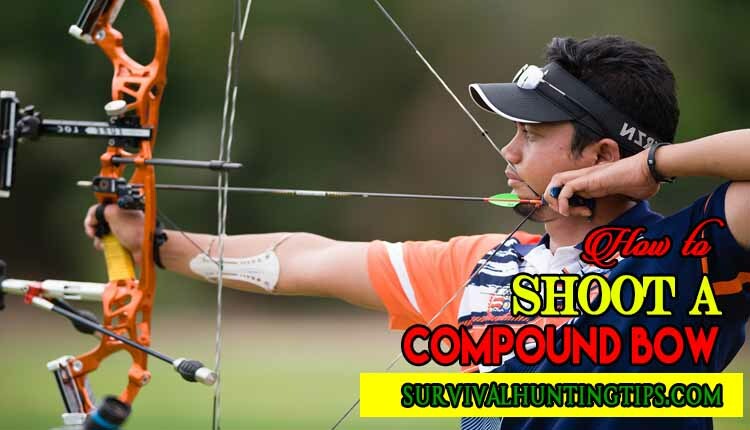 You can go ahead in the venture of compound bow shooting, only through patience and practice, and a training session on How to Shoot a Compound Bow is incomplete without it. You will need a good compound bow to start with the tutorial on How to Shoot a Compound Bow. Do not buy a very expensive one. Just a basic one, suitable for beginners will do. If you would be interested in exploring how to choose your first compound bow in order to learn How to Shoot a Compound Bow, you can check the following link. Sights are one of the most important accessories for a bow given that, you focus through this, every time you draw to shoot. As a beginner, it’s useful to go for a multi-pin sight, for keeping your setup simple and foolproof, which will help you effectively learn How to Shoot a Compound Bow. A release aid helps consistency and supports tighter grouping of arrow shots. In addition, they also keep your fingers safe. You can choose either a thumb button release or a wrist strap trigger finger release. The thumb button release helps archers to hold their sight pins on target. On the other hand, the wrist attaches to the wrist strap release and helps execute quick shots. The best rest at your disposal is decided by the kind of shooting that you are going to do. If it is long range shooting, you can go for drop away rests. It is often the case that your drop would not affect the shot in these kinds of rests. As a beginner, you might have problems with accuracy because of the draw. Therefore, it is advisable to get wrist slings. In addition, these would hold your bow gently into position and make sure that it does not fall off after you had made the shot. It is the most important part of learning How to Shoot a Compound Bow. Because it can decide whether you find your mark or not. As a beginner, it is advisable to use a good release aid. You need to take the release and attach it to your dominant hands. And place the loop on the bowstring around the mouth of the clamp. You need to place the arrow on the rest. In addition, one the brightly colored edge must be pointed up. You need to hold the nock to the bowstring until the clicking sound. The clicking sound is an indication of the Nocking. Measure a distance of about 20 yards. In view of the fact that this is your first shooting, you will use the closest pin set in your bow, at 20 yards. Furthermore, stand in a roughly perpendicular stance, such that the body does not twist during the shot. After that, you need to place your other hand firmly in front of the bow so that you can negate the chances of the bow rotating in your hand while releasing. This hand supports the bow and gives resistance to the bowstring that pulls it backward. In order to draw, it is equally important to lift the bow and keep your arm straight. You can begin by clipping the release onto the string loop, behind the arrow. While pulling, most of the power must come from the muscles at your back. After this, you need to pull in one clean motion by keeping the shoulder blades together. You also need to make sure the bow grip centers in your hand, such that the force of the weight running straight back through your arm. The nock must settle somewhere in your face. Moreover, this itself is the anchor point. This is the last very important step in learning How to Shoot a Compound Bow. You can start by aiming at the target with the pin through the peep sight. It is located on the bowstring. In addition, the forward sight consists of a series of pins, and levels. It attaches to the front of the bow. Meanwhile, shut your other eye and line the target with the top pin. Keep pulling back the bow, without moving across to any one side. The arrow releases in a shock accordingly. The tutorial takes you through the basic steps needed to learn How to Shoot a Compound Bow. However, material that does not clearly ascribe How to Shoot a Compound Bow, in a clean and clear manner fills up the internet. As an archery enthusiast, while beginning my compound bow training, I myself had to go through a lot, stumbling across the half-baked material. On the contrary, this is an attempt to avoid such circumstances for people who are willing to learn the art of compound bow shooting. I would be happy to know if you liked the tutorial. If not, feel free to mention in the comments section. And if you liked it, go ahead and share it. Compound bow shooting is an interesting and exciting prospect for anyone searching for some quality leisure.